You are searching for rare parts for your Porsche ? You want to increase the driving characteristics of your car through classic tuning ? You are searching for the correct parts, a great historic Porsche street or race car ? Or for the right company to let your car being restored or get a complete check ? If you just want to spend a few minutes or a few hours with the cars you love, reading stories and looking at photographs from the past. Then you are just right at magicsix.de, Welcome ! Enjoy your time and don´t hesitate to ask any question . Please use the contact sheet and we will get back to you as soon as possible . Please also take a look at the webpages of our partners to find some more interesting information about their products . 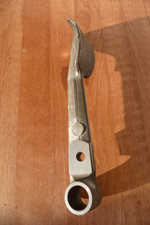 Original engine mount for 911 racing version 911R, ST und RSR, stiffened and lightened, no reproduction! Original manual for 935/77 in wonderful condition, NOS! Rare original manual for 924 SCCA raceversion in wonderful condition, like new! More than 185 drivers, names like Keke Rosberg, Hans-Joachim Stuck, Klaus Ludwig, Didier Pironi, Manuel Reuter, Rolf Stommelen, Manfred Winkelhock, John Fitzpatrick, Derek Bell and many more have geared up to start for Porsche Kremer Racing in the past 49 years. Sold to Kremer Porsche in March of 1985, sold to Almeras for the 1989 season, raced extensively, great history, perfect condition and race-ready! Info sheet and inscription forms for the 2010 edition of the powerslide-trackday now online! Racing fuel tank for 911 ST und RSR, perfect condition, like new! Original manual for Porsche 907 in very nice original condition! Original manual for the 1978 935 version in very nice condition! Oil pressure relieve valve for Porsche 911 RSR und 914-6 GT, attachment at big oil filler neck. Original manual for Porsche 906 from 1966 in gorgeous condition! Original racing oil thermostat for racing oil lines with bigger inner diameter and for bigger connectors. Cast-on section for attachment at car. Pre orders will be accepted for Part III, Prototype - Porsche Racing History in Photographs. The trilogy is now completed with this third part of the limited edition. This car has been build in full specification for appendix K. The body has received a complete new paint job, lightening and has been reinforced. Engine and gearbox are new. You are searching for special tools for your restoration or your racing team? You will find them here! CDI unit for Porsche 910, great condition! Clutch pedal for prototypes like 908, 917, 907 etc. very original, perfect condition! Petrolpics Motorsport Publishing offers a new international calendar for 2009 about the Porsche 908, limited to 908 examples. Reserve your example now ! On the 5th of August we invited Porsche drivers together with the Porsche Centre Willich, the Porsche Club Nürburgring and Porsche Kremer Racing to the Nürburgring. Operating manuals, spare parts lists, a visual tour through Zuffenhausens racing history. Original distributor for 935, good condition. Set of original Porsche Racing carburators, Weber 46 IDA, good condition! Original Porsche Tachometer for Porsche 934 and 935. Correct spare parts number : 911 641 301 29. The tach is dated 8.76, it´s already reconditioned and ready to be installed. Racing Megaphones for 911 2.0l 65-68. They were available with factory sport-kits from that time. The second part of "Porsche Racing History in Photographs - Grand Tourisme 1976-1980" is finally available. Of course this part is also limited to 911 examples and numbered each. Original Scheel bucket seat from the early 70s. Wonderful condition, beautiful patina, ready for direct installation. Was used in 911 ST and 914-6 GT. UPDATE 17.02.2008 · The first project! The vintage Porsche Kremer Racing transporter and service truck will be restored to its original condition. Stay tuned and watch it getting back to its roots. Four original three-piece BBS center lock racing wheels for Porsche RSR 3.0 and 935 . Very good condition, last used at Le Mans classic. Beautiful 911E/ST (Modell 1970) with FIA papers. Body was stripped and rebuilt completely in 2004. Car has been lightened to the exact homologation weight of 960kg. Serviced and maintained by Kremer Racing Cologne. Original spare parts list for 2.8 RSR, DIN A4, edition 1973, 4 languages, like new. 76 Turbo 3.0, 260 HP, 4-speed, slvergreen metallic(266-9-3), ca 120.000 KM, 3. owner, last owner since 1993, blue leather sport seats, completely refurbished including engine, receipts of about 16 000 Euro come with the car. Wind tunnel model of the Kremer K7, scale 1:5, very detailed, more information on request. Like new, perfect condition, also for other 914-6 with MFI. Mark the special preheat section. Original intercooler for 908 Turbo (908/4), perfect condition. 28.08.2007 · The book in 2007 ! Kremer K8 MY 1995. Kremer proprietary development on basis 962, built for Interseries and the 24h Le Mans ( 6. place overall ! ). Carbon Chassis, Porsche flat 6, double overhead camshaft, 3000ccm Biturbo, 17" BBS, big spare parts package available. NOS Porsche 935 racing engine long block . More information and pictures will follow. Please use our contact sheet for more information. Wonderful car, restored 3 years ago for 32 CHF, all documents available, ex swiss car, two owners, 153000 km. Original fuel filler system, complete with bottle and fuel filler neck, for Porsche 911 RSR, 935, 936, 956 or 962. The system is NEW and in perfect condition. Beautiful 1976 911 Carrera 3.0 . This car is free of accidents, has matching numbers and ran only 55000 km. Complete set Weber 46 IDA with intake manifolds and linkage . Please use our contact sheet for more information. Six original cylinder heads from a 2.8 litre RSR, big valves, small spark plugs and 43mm intake/outlet diameter. A warm Welcome to the company of Schrick ! In future you will find camshafts and camshaft kits made by Schrick for street, tuning and racing purposes at magicsix . Certain camshaft profiles are being developed and will be ready in a few weeks . Stay tuned ! A NOS set of Cibie head lamps, still in the original packaging. Housings, reflectors, chrome rings and mounting brackets, everything is NEW !!! For Race- / Rallye- Cars 911 ST, 914-6 GT etc. , perfect condition . 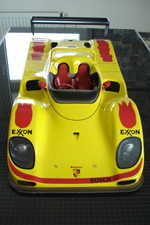 Original front bonnet for 3.0 RSR with balsa wood inserts and the original quick-lock plates mounted. It weighs only 7kg!, needs a bit work, a few holes from the hood mounted head lamps and a crack need to be closed. Complete set of 3-piece BBS center lock racing wheels for Porsche 956 and 935 . Most of the work on parts and cars that are sold through magicsix will be done at the famous Kremer Racing shop in Cologne. We are looking forward to the collaboration with the Kremer Team . Thank you ! At last it is done ! magicsix.de is now ready, in German AND English ! After a long time of work I can now proudly present a place to stay and watch, for all the Porsche enthusiast among you. Thanks for stopping by and visiting us !